When we look deeply at a flower, we can see that it is made entirely of non-flower elements, like sunshine, rain, soil, compost, air, and time. If we continue to look deeply, we will also notice that the flower is on her way to becoming compost. If we don’t notice this, we will be shocked when the flower begins to decompose. When we look deeply at the compost, we see that it is also on its way to becoming flowers, and we realize that flowers and compost “inter-are.” They need each other. 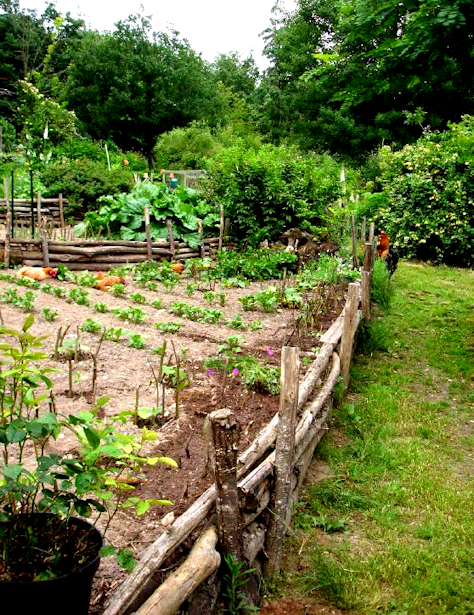 A good organic gardener does not discriminate against compost, because he knows how to transform it into marigolds, roses, and many other kinds of flowers. When we look deeply into ourselves, we see both flowers and garbage. Each of us has anger, hatred, depression, racial discrimination, and many other kinds of garbage in us, but there is no need for us to be afraid. In the way that a gardener knows how to transform compost into flowers, we can learn the art of transforming anger, depression, and racial discrimination into love and understanding. This is the work of meditation. According to Buddhist psychology, our consciousness is divided into two parts, like a house with two floors. On the ground floor there is a living room, and we call this “mind consciousness.” Below the ground level, there is a basement, and we call this “store consciousness” In the store consciousness, everything we have ever done, experienced, or perceived is stored in the form of a seed, or a film. Our basement is an archive of every imaginable kind of film stored on a videocassette. Upstairs in the living room, we sit in a chair and watch these films as they are brought up from the basement. Certain movies, such as Anger, Fear, or Despair, seem to have the ability to come up from the basement all by themselves. They open the door to the living room and pop themselves into our videocassette player whether we choose them or not. When that happens, we feel stuck, and we have no choice but to watch them. Fortunately, each film has a limited length, and when it is over, it returns to the basement. But each time it is viewed by us, it establishes a better position on the archive shelf, and we know it will return soon. Sometime a stimulus from outside, like someone saying something that hurts our feelings, triggers the showing of a film on our TV screen. We spend so much of our time watching these films, and many of them are destroying us. Learning how to stop them is important for our well-being. Traditional texts describe consciousness as a field, a plot of land where every kind of seed can be planted—seeds of suffering, happiness, joy, sorrow, fear, anger, and hope. Store consciousness is also described as a storehouse filled with all our seeds. When a seed manifests in our mind consciousness, it always returns to the storehouse stronger. The quality of our life depends on the quality of the seeds in our store consciousness. We may be in the habit of manifesting seeds of anger, sorrow, and fear in our mind consciousness; seeds of joy, happiness, and peace may not sprout up much. To practice mindfulness means to recognize each seed as it comes up from the storehouse and to practice watering the most wholesome seeds whenever possible, to help them grow stronger. During each moment that we are aware of something peaceful and beautiful, we water seeds of peace and beauty in us, and beautiful flowers bloom in our consciousness. The length of time we water a seed determines the strength of that seed. For example, if we stand in front of a tree, breathe consciously, and enjoy it for five minutes, seeds of happiness will be watered in us for five minutes, and those seeds will grow stronger. During the same five minutes, other seeds, like fear and pain, will not be watered. We have to practice this way every day. Any seed that manifests in our mind consciousness always returns to our store consciousness stronger. If we water our wholesome seeds carefully, we can trust that our store consciousness will do the work of healing.